The Sculptor Galaxy (NGC 253), as seen at near-infrared wavelengths. Credit: 2MASS. The Sculptor Group is a loose group of galaxies visible near the south galactic pole. The group is one of the closest groups of galaxies to the Local Group; the distance to the center of the group from the Milky Way is approximately 3.9 Mpc (12.7 Mly). The Sculptor Galaxy (NGC 253) and a few other galaxies form a gravitationally-bound core in the center of this group. A few other galaxies at the periphery may be associated with the group but may not be gravitationally bound. Because most of the galaxies in this group are actually weakly gravitationally bound, the group may also be described as a filament. It is considered to be at an early stage of evolution in which galaxies are still falling into the group along filamentary structures. The table below lists galaxies that have been identified as associated with the Sculptor Galaxy (and hence associated with the group) by I. D. Karachentsev and collaborators. The object names used in the above table differ from the names used by Karachentsev and collaborators. NGC, IC, UGC, and PGC numbers have been used when possible to allow for easier referencing. 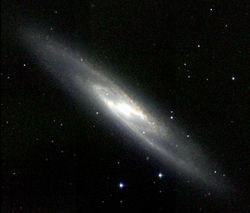 The irregular galaxy NGC 55, the spiral galaxy NGC 300, and their companion galaxies have been considered by many researchers to be part of this group. However, recent distance measurements to these and other galaxies in the same region of the sky show that NGC 55, NGC 300, and their companions may simply be foreground galaxies that are physically unassociated with the Sculptor Group. ^ a b c "NASA/IPAC Extragalactic Database". Results for NGC 253, identified as the core of the Sculptor Group. Retrieved 2006-11-25. ^ a b c d e f I. D. Karachentsev; E. K. Grebel; M. E. Sharina; A. E. Dolphin; D. Geisler; P. Guhathakrta; P. W. Hodge; V. E. Karachentseva; A. Sarajedini; P. Seitzer (2003). "Distances to nearby galaxies in Sculptor". Astronomy and Astrophysics. 404 (1): 93–111. arXiv:astro-ph/0302045. Bibcode:2003A&A...404...93K. doi:10.1051/0004-6361:20030170. ^ a b c d e f g I. D. Karachentsev (2005). "The Local Group and Other Neighboring Galaxy Groups". Astronomical Journal. 129 (1): 178–188. arXiv:astro-ph/0410065. Bibcode:2005AJ....129..178K. doi:10.1086/426368. ^ a b Burnham, Robert (1978). Burnham's Celestial Handbook; An Observers Guide to the Universe Beyond the Solar System; Volume Three, Pavo Through Vulpecula. Dover Publications, Inc. p. 1736. ISBN 0-486-24065-7. ^ a b c Lianou, S.; et al. (February 2013), "Population gradients and photometric metallicities in early- and transition-type dwarf galaxies: Clues from the Sculptor group", Astronomy & Astrophysics, 550: A7, arXiv:1211.3170, Bibcode:2013A&A...550A...7L, doi:10.1051/0004-6361/201219959. ^ a b c d e "NASA/IPAC Extragalactic Database". Results for various galaxies. Retrieved 2006-11-25. This page was last edited on 28 November 2018, at 06:23 (UTC).